SUSPENDER DRESSES!! It's like the trend gods suddenly understand how hard it is to find a dress to breastfeed in, and have bestowed upon us this fine gift in the form of a Friend's flashback. So our many thanks to YOU trend gods. 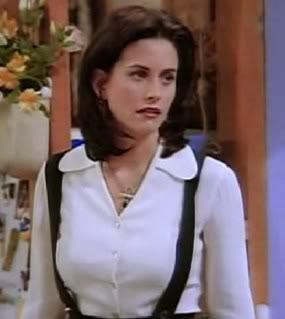 And to you too Monica, for blazing the suspender dress trail. But most especially, to YOU Netflix. This dress may actually have nothing to do with you, but we all know who the real hero is. I'm really digging this 90's revival! I wish my computer keyboard had the "both hands raised in the air in celebration" emoji. I'd comment at least twelve of those in honor of that dress. Too cute! My productivity has really gone downhill since Friends has been on Netflix. You are adorable! This dress is adorable! Stylish mamas are so inspiring and you're at the top of my list. I love that dress and converse combo! It was so hard to find an outfit to breastfeed in! My family and I went on vacation and all of my dresses and outfits were not accessable at all! Looking so beautiful in this cute, casual outfit! I'm not pregnant, nor do I have children yet, but I constantly worry about clothing whilst pregnant or thereafter.... This looks like a savoir! You pull that off so very well! I don't think I'd ever dare myself..
you have a gift for wearing something i thought i hated and making it look awesome. congrats. So 90's! You make it look so good!